Fudge. Who doesn’t love it? It’s everything we aren’t supposed to eat, laced with sugar and fat. It’s rich, creamy, and oh, so sweet. Fudge vanishes at bake sales and buffet dessert trays faster than money out of my bank account too. It can be infuriating to learn to make the old fashioned way, but you can get some very good fudge with any of the myriad of no fail and microwaved recipes too. 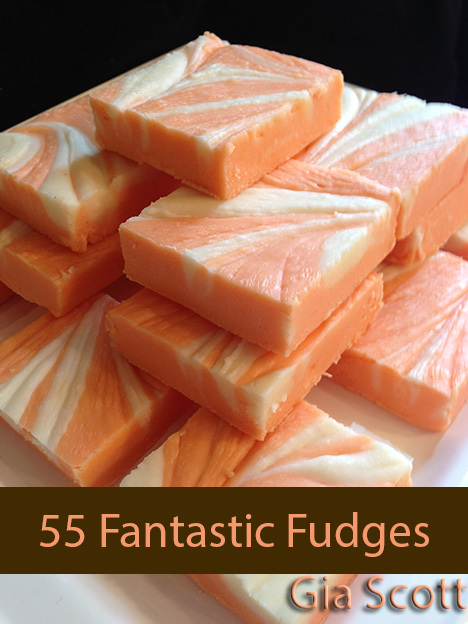 So what can possibly be better than fudge itself? So, in honor of the newest release of my cookbooks for Kindle…it IS free for the next couple of days. All you have to do is go here to get it: http://bit.ly/55fudges That’s Amazon–and there are no weird popups or ads either. You don’t even have to have an e-reader. Amazon offers apps that work on iPad, iPhone, Android, Mac, and PC too, and the apps are always free. I regularly use the Android and PC apps–they work great. There is only one “catch” to the free cookbook. Please, after you read it and try it out, go back and write a review, would you please? It’s very important to me! And with the cookbook, I hope all of you have plenty of ammunition to make your own homemade treats for gift baskets for the holidays this year! This entry was posted in buffet, Candy, Cookbooks, Easy, freebies, Potlucks & church suppers, Quick, Recipes, Shopping and tagged candy, christmas, dessert, easy, old fashioned, recipes, shopping. Bookmark the permalink.